(I long for arrow, lance, dagger and sword/ Oh so-called (Muslim) don’t walk with me because I long to emulate Hussain’s sacrifice). (Husayn is lord and the lord of lords. Husayn himself is Islam and the shield of Islam. Though he gave his head (for Islam) but never paid allegiance to Yazeed. Truly Husayn is the founder of "There is no Deity except Allah). 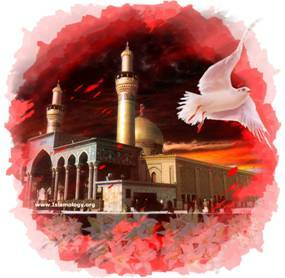 (Hussain is the leader of the lovers and the son of Hazrat Fatima (RA). He is the cypress tree of the Prophet’s garden. 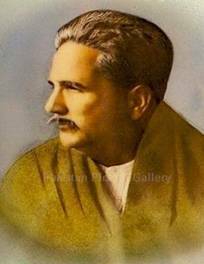 In the second couplet Allamah Iqbal is indicating towards a Shiah tradition where Hazrat Ali (RA) reportedly said that the “nuqta” of the letter “Ba” in Bismillah, which is the essence of the Holy Qur’an, is him (Ali). Therefore it points to the glory of Hussain whose father is the “Baey Bismillah” and who himself is the exposition of the ultimate sacrifice. (The story of Kaaba inspite of being plain and interesting sounds strange. Its foundation was laid by Hazrat Ibraheem (AS), in its early days Hazrat Ismaeel (AS) rubbed his feet out of thirst. It was cleansed of idols by Prophet Muhammad (SAW). Its sanctity was protected until the day of judgment through the ultimate sacrifice of Imam Hussain). (The friendship of Ibraheem (AS) is also love and so is the patience of Hussain/ In the struggle of existence Badr and Hunain are also examples of love). (When Khilafat strained its relationship with the Qur’an and abandoned Islamic and Qur’anic ideals by transforming it into a kingship and when freedom was poisoned, the grandson of Prophet Muhammad (SAW) did not tolerate its injustices. Like a blessed cloud he marched forwarded and through his rain of blood transformed the desert into a garden of martyrs. By doing so he ended the reign of injustice and breathed new life into the garden of freedom. (Hussain’s enemies were innumerable like grains of the desert sands/ Whereas his companions equaled ‘Yazdaan’ (Lovers). The numerical value of the word ‘yazdaan’ comes out to be seventy two which was the number of Hussain’s companions). (I have learned the secrets of Qur’an from Hussain. I have inflamed my lamps through Hussain’s candle).